Fashion DIY: Oh We Got That Disco. D-I-S-C-O. And We're In Heaven!! 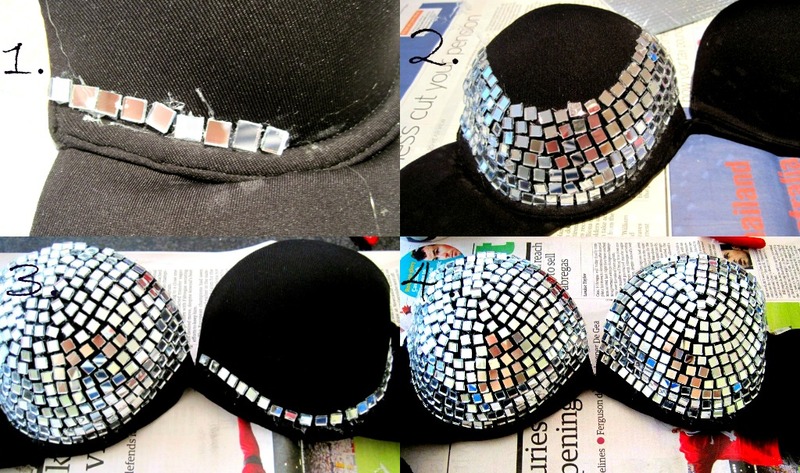 "The ball is turning, 300 mirrors burning, through the hearts of the crowd..." As Gaga would say and what better way to bring a bit of disco into our lives that recreating her Disco Ball bra! 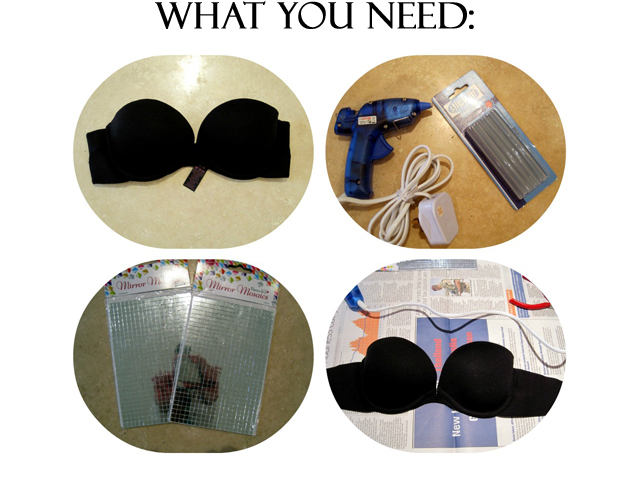 The bra looks absolutely stunning on and is so easy to make. All you need is an old bra, square cut mirror tiles, a glue gun and about 5 hours to spare. Here is a list of all the things I used for the DIY. 1) Begin by separating out each tile individually so that you can get to them quickly once you begin gluing. Turn on the glue gun, load glue and wait for it to heat up. Once ready, place a small bead of glue onto the bra close to the wiring and fix the tile to the bra. Repeat all the way around the edge of the bra. 2) Build this up, repeating tile after tile, placing the tiles equal distance apart until you have covered the whole cup. Don't worry about the strands of glue that stick to the bra, they are really easy to peel off once they have dried. 3) Begin on the second cup, trying to copy the pattern of the opposite cup so that they look equal. 4) Cover the whole of the second cup, just as you did with the first until it is complete. Once it is covered, you can begin picking off any dried glue that has got stuck to the bra in the process. You now have your Lady Gaga inspired bra to conquer the dance floor in. Go party Little Monsters!!! por cierto, donde se pueden encontrar los espejitos esos??? besos! y felicidades por esta magnifica obra! but where can I buy the mirrors? with a see through tank top...amazing! Amazing project and great blog! I wouldn't wear this to a party. The host is likely to demand you stand in the middle of the dance floor and rotate all night. I have never heard of a Lady Gaga themed party. It sounds fun and creative. please visit me and if you can, follow me :)♥♥:*. If you're on Facebook, please visit my Facebook fan page and "like" it! WOW! !Amazing DIY! Very very Gaga! very very cool this idea :D you rocks! Really really cool...I'm gonna do this DIY as well! :)) Awesome!